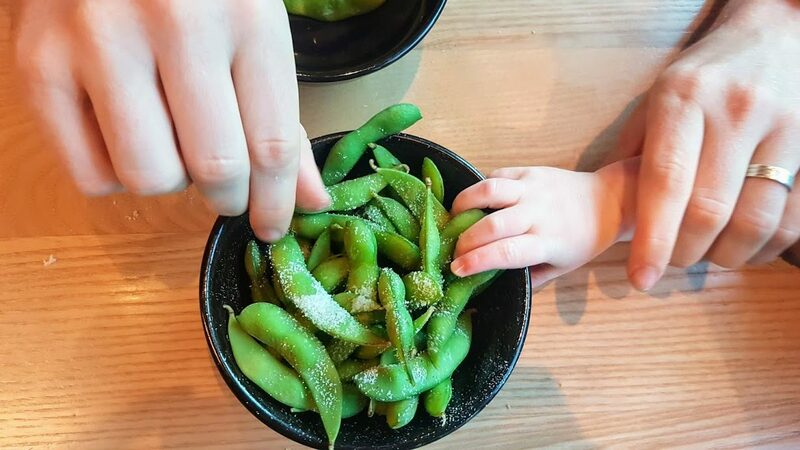 As always we started with the edamame beans (honestly, I could eat bowls of them for days) with plain salt instead of the chilli garlic ones for a change, which are equally delicious. Accompanied by an Asahi beer for James and the Supergreens juice for me – a refreshing blend of apple, mint, celery and lime – we ordered Tom a bowl of the Mini Chicken Cha Han from the menu: stir-fried white rice with chicken, egg, sweetcorn, carrot, mangetout and amai sauce. At 11 months old he’s at that stage of weaning where we’ll let him try pretty much anything (to a certain degree haha) so this was a really enjoyable and obviously messy experience. He loved the egg chunks and gnawing on the chicken, and although he wasn’t too fussed about the sweetcorn he wolfed down a decent amount of the rice. Yes lad! 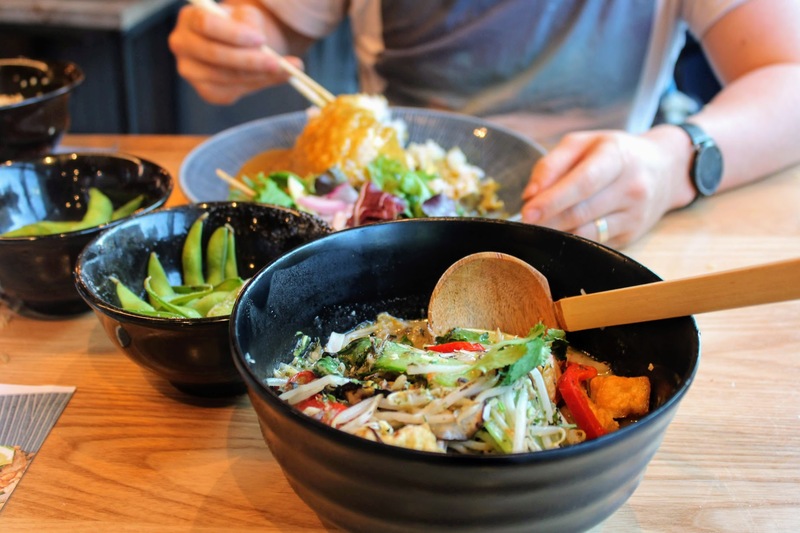 Aiming to push the vegan offerings, I went for my usual favourite: Itame Yasai; rice noodles in a spicy green coconut and lemongrass soup topped with stir-fried beansprouts, red and spring onions, bok choi, peppers, mushrooms and chilli. garnished with coriander and fresh lime. Absolutely packed with rich, fragrant and punchy flavours, this is a dish that really warms you up and gets the tastebuds going. Onto dessert: James loved the Chocolate Layer Cake, made up of layers of chocolate sponge, dark chocolate parfait and hazelnut cream, served with vanilla ice cream. NOM. I fancied something refreshing so went for the Pink Guava & Passionfruit Sorbet with mint which was the perfect combination of sweet and tangy, light but creamy, which Tom also enjoyed too!